The 10-year-old Pennsylvania girl who fought for a lung transplant has a difficult journey ahead. The transplant isn't a cure for her cystic fibrosis, and new lungs don't tend to last as long as other transplanted organs. But it can extend life by years, buying some time. "You're keeping them alive and hopefully well, hoping that something else will come along that will make the big difference," said Dr. Anastassios Koumbourlis, pulmonary chief at Children's National Medical Center in the nation's capital. 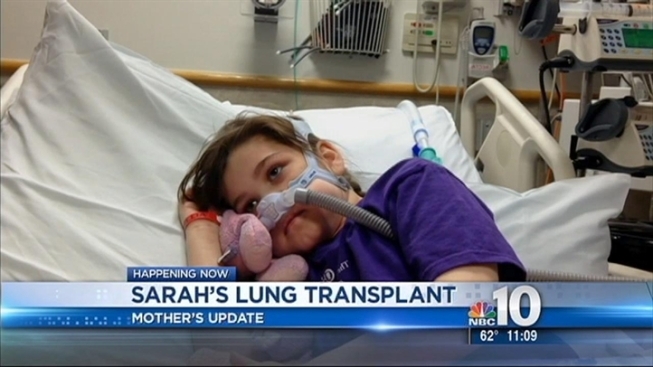 Sarah Murnaghan, who is recovering from Wednesday's operation at the Children's Hospital of Philadelphia, made headlines as her parents challenged national policy over how children under 12 are placed on the waiting list for donated lungs. Lost in the debate over how to give out scarce organs was this broader question: How well do children with cystic fibrosis fare when they do get a new set of lungs? Fortunately, few children get sick enough anymore to need transplants, said Dr. Stuart Sweet, pediatric lung transplant chief at Washington University in St. Louis. Treatments for the genetic disease have improved so much over the past decade that patients live much longer before their lungs start to wear out. About 30,000 Americans live with cystic fibrosis, which causes sticky mucus to build up in the lungs, leading to life-threatening infections in the lungs and problems in other organs. Only a few decades ago, children with the disease seldom survived elementary school. Now the typical life expectancy is about 37 years and growing. A 2007 study published in the New England Journal of Medicine prompted major controversy over whether lung transplants offered enough survival benefit to be used for cystic fibrosis. Ultimately, doctors decided it did, for the right patient who is out of options. Since then, about 150 to 200 people with the disease, mostly teens and adults, have gotten lung transplants every year, according to a patient registry run by the Cystic Fibrosis Foundation. More than 80 percent of patients who get new lungs survive a year, and more than 50 percent are alive after five years, the registry shows. That's a sobering statistic, although some people survive much longer. For comparison, well over 90 percent of people who receive a kidney transplant survive five years. "We expect it will be a long road, but we're not going for easy, we're going for possible," Sarah's family said in a statement after her surgery. Sweet said the issue isn't the cystic fibrosis but that lungs simply are difficult to transplant, no matter what the underlying disease. "The reality is that lung transplantation is not a perfect solution," Sweet said. After all, "this is the only organ we transplant that's in contact with the outside world," added Dr. Karen McCoy, pulmonology chief at Nationwide Children's Hospital in Columbus, Ohio. For cystic fibrosis patients, the donated lungs don't contain the defective gene that caused their own lungs to clog -- so they won't fill with mucus again. Cystic fibrosis will continue to damage their pancreas, intestines and other parts of the body, requiring ongoing treatment to deal with nutritional problems and other symptoms. But patients may be at higher risk of post-transplant lung infections for a different reason: Some of the antibiotic-resistant germs that infected their old lungs can still be lurking in their sinuses. They can travel to the new lungs as patients begin taking the immune-suppressing drugs necessary to prevent organ rejection, McCoy said. Eventually, many transplant recipients suffer lung failure as some of the tiniest airways in the lungs break down, in part due to infections. Some qualify for another transplant, but second transplants aren't as successful. Stay tuned: Treatments that target the specific gene defect behind most cases of cystic fibrosis are being researched. If they pan out, eventually fewer patients may need transplants.